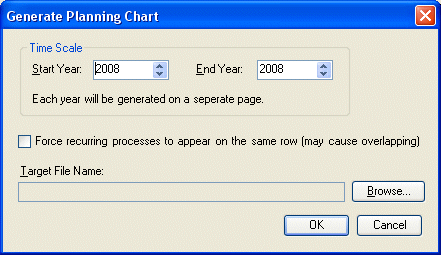 The Planning Chart is a tool that generates boxes on a Year Planner style diagram corresponding to processes that occur at the same time each year. The Planning Chart is generated with months of the calendar year as columns across the top of the page and laid out on an A0 page size. The process block are shown in alphabetical order by Process Title. The process blocks are clickable through to the associated process map. To Generate the Planning Chart, from Process Navigator select the maps to include in the Planning Chart, then select Multi-Map > Generate Planning Chart. Force recurring processes ..... If this is Checked then for blocks on the Planning Chart will be at the same height up the page, even if they overlap with a block from a previous or subsequent year, otherwise the block will move down one row for each year generated. Target File Name - the file that will contain the Planning Chart.